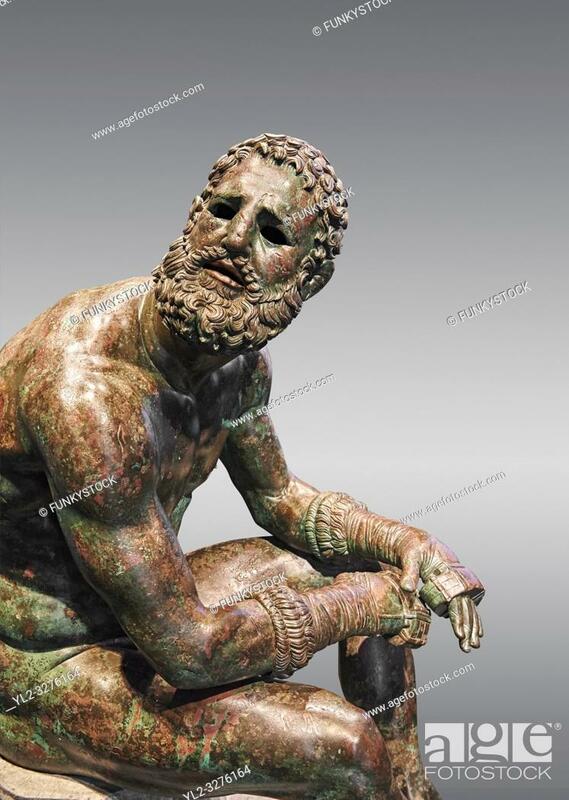 Foto de stock - Rare original Greek bronze statue of an Athlete after a boxing match, a 1st cent BC. The athlete, seated on a boulder, is resting after a boxing match ... . The boulder is a modern addition that replicates the ancient original. The face, ears, and nose are severely wounded by blows received during the match. No wounds appear on the body since ancient boxing practices made the afce the main target. The boxer is only wearing a sort of loin cloth (kynodesme) around his waist. Elaborate leather gloves (himantes oxeis) protect the hands and the forearms. They consist of thick leather straps that bind the four fingers, leaving the thumb free. On the forearms the gloves are bordered with fur lining. A series of marks on the straps above the left ring fingers seem to be a signature of the Athenian sculptor Appolonios, son of Nestor who was active during the 1st century B. C. Careful analysis shows that the marks are actually corrosions of the bronze surface. The Greek letter â. . aâ. . is impressed on the middle toe of the left foot and is probably a mark identifying the workshop that produced the statue. The statue of the boxer is of the highest quality with a highly detailed rendition of the athletic anatomy and facial feature. The artist was clearly inspired by the style of Greek sculptor Lysippus and scholars generally consider it an original Greek bronze of the 1st Century B. C. . The National Roman Museum, Rome, Italy.